Guardian Telly on Google TV… Is the OU There, Yet? Liam’s app is interesting for a couple of reasons: first, it demonstrates how to access data – and then content – from the OU’s open Linked Data store (in a similar way, the Guardian app draws on the Guardian Platform API, I think? ); secondly, it demonstrates how to use the Google TV templates to get put a TV app together. As well as video and audio based course materials, seminar/lecture recordings, video shorts (such as the The History of the English Language in Ten Animated Minutes series (I couldn’t quickly find a good OU link? )), the OU also co-produces broadcast video with both the BBC (now under the OU-BBC “sixth agreement”), as well as Channel 4 (eg The Secret Life of Buildings was an OU co-pro). Many of the OU/BBC co-pro programmes have video clips available on BBC iPlayer via the corresponding BBC programmes sites (I generate a quite possibly incomplete list through this hack – Linked Data Without the SPARQL – OU/BBC Programmes on iPlayer (here’s the current clips feed – I really should redo this script in something like Scraperwiki…); as far as I know, there’s no easy way of getting any sort of list of series codes/programme codes for OU/BBC co-pros, let alone an authoritative and complete one). 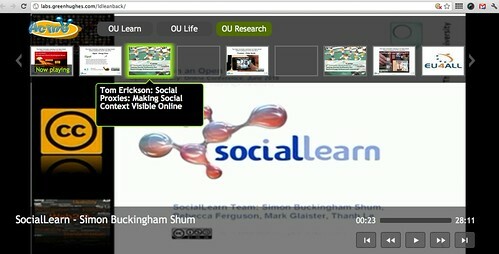 The OU also gets access to extra clips, which appear on programme related pages on one of the OpenLearn branded sites (OpenLearn), but again, there’s no easy way of navigating these clips, and, erm, no TV app to showcase them. Of course, you might argue that this is all off-topic for the OU… but it isn’t if your focus is the OU’s broadcast activities, rather than formal education. If a fraction of the SocialLearn spend had gone on thinking about second screen applications, and maybe keeping Boxee/Google TV app development ticking over to see what insights it might bring about increasing engagement with broadcast materials, I also wonder if we might have started to think our way round to how second screen and leanback apps could also be used to support actual course delivery and drive innovation in that area? PPS via a tweet from @barnstormed, I am reminded of something I keep meaning to blog about – OU Playlists on Youtube. For example, Digital Nepal or 60 Second Adventures in Thought, as well as The History of English in Ten Minutes. Given those playlists, one question might be: how might you build an app round them?! Interesting post Tony, though I had to quiz Martin to find out what a leanback app is :} I would definitely have thought the internet tv approach would be of considerable interest and benefit to the OU for distributing content to a growing general audience. If there was an OU “channel” on my internet enabled tv I’m sure I’d watch it!